At such a difficult economic junction, where the government doesn’t seem to know whether we are coming out in plunging into recession, many businesses can find themselves needing a sales boost in order to confirm their security. The following tips can help any business, large or small, to energise their sales figures and have them feeling confident about the future. If sales or profits have taken an unexpected dip, it might be because customers are being disengaged from a brand message. This can be down to a lack of market research; carrying out one-on-one interviews or focus groups with new and prospective clients can help to establish exactly who the target market is, what they buy, and why they are investing their money into it. This understanding can then be translated into an effective brand message delivered through the most appropriate medium, whether it be physical newsletters or social media. Short-term promotions and incentives can be a great way to draw in business quickly for a sales energiser. The prevalence of social media and the internet now means that flash sales can be announced and the word can be spread to all clients via an email or notification within just a few hours. There are no extensively researched flyer marketing schemes, exhibitions with large format printed displays or intricate guerrilla marketing ploys; just a simple virtual update. Alternatively, drum up excitement for a few weeks prior to a large one-off event; an open day, extended opening hours, a day of discount or a special event at a hired venue can all draw in extra numbers of customers and boost sales. Repeat custom is one of the biggest profit areas for thousands of organisations, so in attempting to drive new custom and energise sales, it is important not to forget these loyal clients. Retention campaigns often take the form of direct mail or email promotions which go out on a regular basis; start a sales drive by upping the number of emails from fortnightly to weekly and up-selling to existing customers. This method also provides an opportunity to discover which incentives and messages gain the best reaction, for future reference. A growing number of SMEs in the UK have their own website and online content, and online sales now form a large percentage of all of the UK’s economic activity. However, for many businesses, there can be a temptation once a website is up and running, to think that no further action or maintenance is required. Updating a website’s content and keeping it fresh and relevant is one of the best things a business can do to boost sales. Regular customers will spend more time on the site keeping up to date with blogs or news updates, whilst prospective clients will be encouraged by the fact the business takes their online presence seriously. In such a saturated market, businesses can often find it difficult to stand out with their products and services alone. Teaming up with a non-profit charity organisation and aligning the business as corporately responsible is a great way to empower sales and attract new clients. A promotional campaign in which a percentage of sales goes to charity, or providing a service free of charge for a charity can not only be good for business karma, it can also be a great marketing ploy and help to drive appreciative customers through the doors. Sales in the twenty-first century are often built on trusting relationships between clients and a business. This relationship can only be built through the medium of great customer service, so polishing the follow-up procedure within a company is a great way to ensure the client-business relationship is strong. Ensure everyone who takes inbound calls, be it receptionists or sales staff, asks the relevant questions about how the client heard of the company, and ensure that any leads are followed up within twenty-four hours. 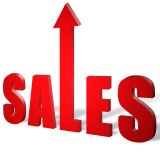 Boosting sales is not a one-size-fits-all process, with definitive steps for each business. Experimentation can often pay off as each business finds what works for them. Some businesses find they get their best deals from special combination packages, others find that having flash sales is the best way to boost their profits. Where one business might swear by appealing to the bargain hunters among their clients, another business might market their products so as to encourage the customer to believe in quality over quantity.